News and thoughts on... Everything Apple, of course. As you can see from the above picture, even the Startup Disk option in the System Preferences would simply not see the drive as a bootable one. It turns out the reason for this is that I had previously formatted the drive with a GUID Partition Table, which is incompatible with PowerPC Macs for boot disks. 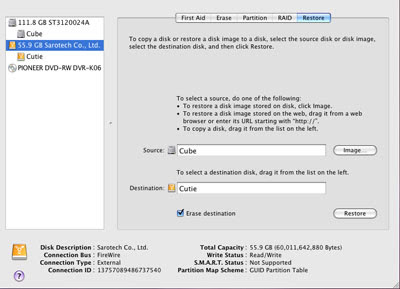 During the clone process, Disk Utility erased the drive, but didn't reformat it, which means that the cloned drive had the entire OS present on it, but with the wrong type of partition table. However, when I tried this cloned G4 drive on my Core Duo MacBook, the boot disk worked fine, as did all the applications I tried. It would seem that the OS install is the same. The only significant difference is the partition map. 1. Open up Disk Utility and select your backup drive. Select the "Partition" tab. 2. 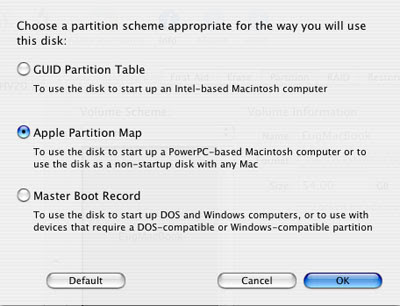 Go to the "Options" and choose "Apple Partition Map", which is the partition type necessary for PowerPC Macs. 3. Format the drive using the above settings by hitting the "OK" button and then the "Partition" button. This will delete everything on the selected drive. 4. 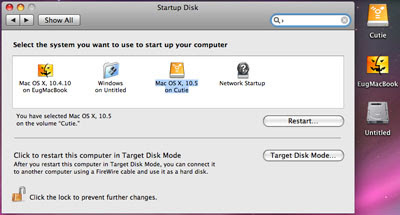 Clone an Intel Mac's Leopard install to the external drive, using Disk Utility's "Restore" tab (or else another program such as Carbon Copy Cloner). 5. After you have double-checked which drives are the proper source and destination disks, start the clone process by hitting the "Restore" button. However, I have not tried this method yet to confirm if this works. If anyone has the time to try this, please tell us your results. Otherwise, I will try it in the next little while when I have some more time. great! it did work out for me! just cloned intel macbook pro to a powerbook powerpc and everything seems to be fine. Thanks! Awesome tip. I installed it from a 2008 MacBook and loaded into a 2006 PowerBook G4, which would otherwise only install with the original RAM in place. the only problem is that GUID is used for firmware updates. So you can't update your intel mac's firmware whilst booted from a APM partitioned drive. THANKS, This worked out really great for me bcos I could not use the GUID partition table. I transferred an install of leopard from my MBP to my Power Mac G4 through Target Disk mode (Firewire) and it worked great.